MEMBERS: Hyde (vocals), Ken (guitar), Tetsu (bass), Yukihiro (drums). AGE: Hyde - ?, Ken - 11/28, Tetsu - 10/3, Yukihiro - 11/24. The group started out with a drummer other than Yukihiro (in the indies days), who was then replaced by Sakura (who was their drummer when the band debuted on a major label). Sakura was ousted from the band in 1997, due to drug problems. In fact, this caused such a stir, that their single at the time ("The Fourth Avenue Cafe") was taken off shelves a very short time after it was released. Hence to this day, it's a fairly rare single to come by. It was even pulled off the air as the ending theme to popular anime "Rurouni Kenshin". Yukihiro joined the band in early 1998 as the drummer. There was also a guitarist that was a member of the group before Ken (in the indies days), but they don't reveal his name. 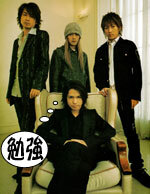 Bloodtypes: Hyde - ?, Ken - AB, Tetsu - A, Yukihiro - A.